DSL modems bring the Internet to your home or business. They offer a high-speed and reliable connection to the Internet that is always on and always connected, whereas the router is the heart of your digital home, allowing you to connect and share the Internet with everyone in your house. HD streaming & gaming on multiple devices The DIR-885L/R delivers premium performance for large homes and for users who demand faster Wi-Fi speeds for HD streaming and gaming on multiple devices. This router is packed with the latest technology and an awesome design that will make your friends jealous. Dual band with a kick Independent data streams are delivered to each device on the network for speeds of up to 3,167Mbps. Best performance for streaming your favorite movie or playing games with your friends. Multi-user MIMO The DIR-885L/R is designed to support MU-MIMO technology that allows multiple devices to get high-bandwidth Wi-Fi signal at the same time, distributing data more efficiently, giving you the fastest Wi-Fi speeds in your home. You can stream HD media faster, transfer large files really fast and play lag-free gaming. More processing power A 1.4GHz dual-core processor boosts multitasking computing power and improves throughput speeds for all of your applications. Smart connect Not all Wi-Fi bands are the same, but you don’t need to worry about that. With Smart Connect Technology, the ULTRA Wi-Fi Router chooses from the two Wi-Fi bands and automatically connects each device on your network to the best, clearest band available for the best connection every time. Smart beamforming Improves coverage by directing bandwidth to your devices as you move around your home. You can stream HD video, surf the web, skype your friends and play online games from wherever you are so you’ll always get the best experience. More processing power Want a powerful high-performance processor that can handle multiple tasks at incredible speeds? A dual-core processor boosts multitasking computing power and improves throughput speeds for all of your applications. Fast gaming experience With powerful dual-core processor, simultaneous 4 data streams and intelligent QoS technology, enjoy the ultra Wi-Fi speed for uninterrupted gaming and unbeatable experiences. 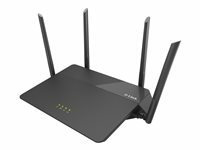 Multi-User MIMO (MU-MIMO) The AC2600 MU-MIMO Wi-Fi Router is designed to support MU-MIMO technology that allows multiple devices to get high-bandwidth Wi-Fi signal at the same time, distributing data more efficiently, giving you the fastest Wi-Fi speeds in your home. You can stream HD media faster, transfer large files in seconds and play lag-free gaming. Smart beam forming Improves coverage by directing bandwidth to your devices as you move around your home. You can stream HD video, surf the web, skype your friends and play online games from wherever you are so you'll always get the best experience. High-speed wired and wireless connectivity The DIR-878 upgrades your network to the latest dual-band high-speed wireless technology to bring you lightning-fast Wi-Fi speeds of up to 1,900 Mbps so you can meet the increasing demand from multimedia applications. Enjoy seemless high definition streaming media, Internet phone calls, online gaming, and content-rich web surfing throughout your home or office. In addition, 10/100/1000 Gigabit Ethernet ports give you solid, dependable wired performance for devices such as Network Attached Storage (NAS), media centers, and gaming consoles. The built-in Quality of Service (QoS) engine allows you to prioritize important traffic to ensure that your favorite applications are receiving optimal bandwidth. 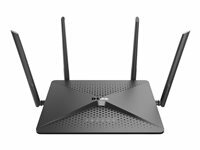 Smooth streaming with wireless 802.11ac wave II The DIR-878 brings a host of technologies to create the best wireless networking experience to date. 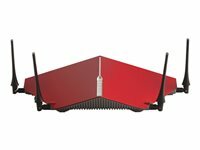 With 802.11ac Wave II technology, the DIR-878 provides Gigabit wireless connectivity with combined transfer rates of up to 1,900 Mbps (1300 Mbps Wireless AC + 600 Mbps Wireless N). Featuring a 3x3 MU-MIMO antenna configuration, the DIR-878 offers better data rates, fewer dead-spots, more coverage, and increased reliability. Upgrade your home or office with the latest AC wave II technology by matching the DIR-878 AC1900 MU-MIMO Wi-Fi Gigabit Routers with AC wave II devices like the DWA-192 AC1900 Wi-FI USB 3.0 Adapter to take full advantage of this speed. Easy to set up and protect Sharing your Internet connection doesn't have to be a complicated process; just open a web browser to access the setup wizard and follow the easy step-by-step instructions to get started. Configure, apply, and set up WPA/WPA2 wireless security in minutes with the wireless network setup wizard, or use Wi- Fi Protected Setup (WPS), which establishes an encrypted wireless connection to new devices without the need to enter settings or create passwords. In addition, the built-in firewall requires no setup, protecting you against malicious attacks from the Internet, and access control features allow you to restrict access to your network giving you greater control over network users. Hassle-free D-Link smart connect technology Ever since the introduction of 5 GHz wireless technology, users have had to blindly guess whether the 5 GHz or 2.4 GHz band would provide them with the best networking experience. D-Link's Smart Connect Technology eliminates this confusion by automatically distributing devices to the optimal network. Simply initiate a connection to the DIR-878 and its advanced algorithms will determine the best network for your device to connect to, thereby ensuring a faster, more reliable, and hassle-free experience for your friends, colleagues, and family. 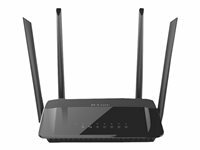 High-speed wireless connectivity The DIR-809 Wireless AC750 Dual Band Router uses the latest high-speed wireless technology to bring you lightning-fast Wi-Fi speeds of up to 433 Mbps on the 5 GHz frequency band and 300 Mbps on the 2.4 GHz frequency band. Dual band wireless for seamless performance Surf the web, chat and play online games on the 2.4 GHz band with your smartphones and computers, while simultaneously streaming digital media on the 5 GHz band on your streaming media players and tablets. 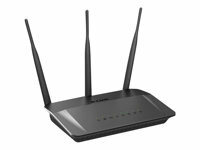 Extend your existing wireless network You can also use the Wireless AC750 Dual Band Router to increase the coverage of your existing home Wi-Fi network. Easy to set up, easy to secure Just open a web browser to access the setup wizard and follow the easy step-by-step instructions to get started. You can also use the QRS (Quick Router Setup) Mobile app, available for iOS and Android smartphones and tablets. Superior wireless performance Designed to deliver superior wireless performance, the DSR-250N include 802.11 b/g/n, allowing for operation on the 2.4 GHz wireless LAN radio bands. Multiple In Multiple Out (MIMO) technology allows the DSR-250N to provide high data rates and a wide wireless coverage area with minimized "dead spots". Robust VPN features A fully featured virtual private network (VPN) provides your mobile workers and branch offices with a secure link to your network. The DSR-250N is capable of simultaneously managing 5 Secure Sockets Layer (SSL) VPN tunnels respectively, empowering your mobile users by providing remote access to a central corporate database. Site-to-site VPN tunnels use IP Security (IPSec) protocol, Point-to-Point Tunneling Protocol (PPTP), or Layer 2 Tunneling Protocol (L2TP) to facilitate branch office connectivity through encrypted virtual links. The DSR-250N supports up to 25 simultaneous VPN tunnels. Efficient Green technology As a concerned member of the global community, D-Link is devoted to providing eco-friendly products. D-Link green Wi-Fi and D-Link green Ethernet features save power and help cut energy usage costs. The D-Link green WLAN scheduler shuts down your wireless network automatically according to a schedule you define, allowing you to turn off your wireless network during off-peak hours, saving energy and keeping your network secure. 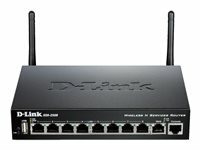 The D-Link green Ethernet feature can detect the length of the cables connected to the router, and can adjust power usage accordingly to save energy automatically without sacrificing performance. It can also detect if a link is down on a port, and automatically puts that port into a sleep mode that drastically reduces the amount of power used. In addition, compliance with RoHS (Restriction of Hazardous Substances) and WEEE (Waste Electrical and Electronic Equipment) directives make D-Link green certified devices an environmentally responsible choice.